I made this last night and it deserves to be remembered and shared. I used Stilton instead of Gorgonzola and the “pickled pears” were replaced by some chopped up poached pears (pears, water, sugar, star anise and stem ginger) I had left over from Sunday lunch. I didn’t use nearly as much cheese as I think it might have been a little too strong. Personal taste though I suppose. Break the cauliflower into small florets. Melt the butter into a saucepan and sweat the onions gently over a medium heat for about 5 minutes until translucent. Add the cauliflower, thyme and bay leaves. Season. Pour in the chicken stock and bring to a simmer. Cover and simmer for about 20 minutes or until the cauliflower is soft. Crumble in the Gorgonzola and stir over a low heat until it has melted. Add the creme fraiche and stir to combine. Pick out the herbs and blend the soup until smooth. Return to the pan and heat through. Check for seasoning. Soak the cranberries for about ten minutes in warm water to soften. Core and chop the pears and apple into small dice. Melt the butter in a small pan over a low heat. When it begins to foam, add the diced fruit and cook for 5 minutes until starting to soften. Add all the other ingredients (except the salt and pepper) and cook for a further 8-10 minutes. Taste and season if necessary. Remove the cinnamon and thyme. The relish will have a shiny, jewel like lustre. Serve warm. 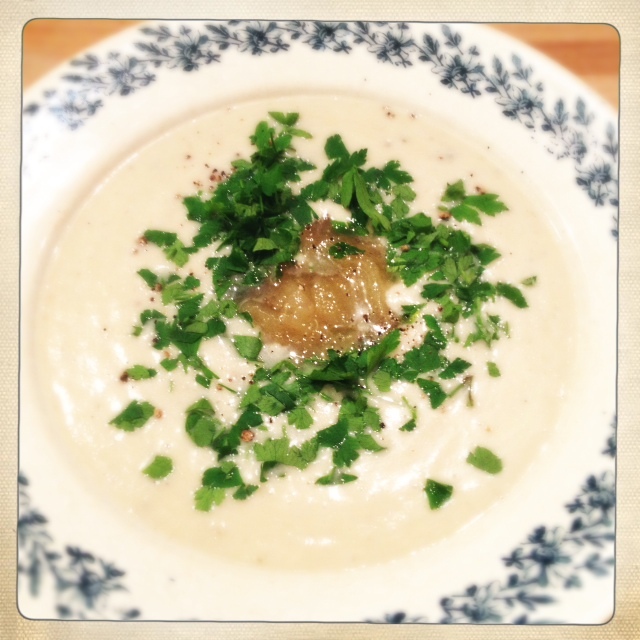 Serve the soup warm with chopped flat leaf parsley and a some of the pear relish heaped in the middle. Absolutely incredibly delicious.